In this tutorial I will demonstrate a MSP430 voice control over Bluetooth, using a HC06 Bluetooth module. I will be using an Android App I programmed which can be downloaded and installed, the C code for the MSP430 is also downloadable at the end of the tutorial. So before we look at everything in further detail, the video below gives a demonstration of what the simple App and basic hardware set/up can do. Note it was filmed with an older phone, so excuse the quality and dodgy camera angles. This is my first foray into bluetooth, I will be looking at Bluetooth 4 (aka BLE) soon, but for now lets take a look at the HC06 bluetooth module. The image above shows the HC06, the module is shown already soldered to a blue PCB and a connecting wire. I purchased the whole assembly for under £3.50 including postage and packaging from Ebay. You can also buy the module on it’s own for even cheaper, but you then need to mount it on a suitable PCB, as well as taking into account a few configuration considerations. If you want to keep things simple then I recommend buying the same assembly as used in this tutorial. An alternatively option if you looking for a neater Boosterpack design, is to source some parts from the 43oh website store, they sell the modules and Boosterpack PCB. So lets look at a few specifications for the module, I have just listed the ones that are pertinent, bear in mind any module you buy may differ slightly. The HC06 kits has six external connections, only four have header pins connected these are VCC, GND, TXD and RXD (Wakeup and State are not connected). The TXD and RXD form the transmit and receive for a serial connection, these will be connected to the Universal Asynchronous Receiver/Transmitter (UART) on the MSP430G2553. For this tutorial I kept it very simple, the demonstration uses the Launchpads on-board LED’s. The VCC and GND pins from the bluetooth module are connected to the launchpads VCC and GND pins. TXD from the module is connected to P1.1 on the launchpad, this is the UART receive, and RXD from the module is connected to P1.2 on the launchpad, this is the UART transmit. The image below should clarify the connections, as it shows the colour coded wire clearly. Thats all there is to it for the hardware set-up, there was no need to add any further electronics as the potential control applications will become evident. I was originally just playing around with the UART, and had intended to write a tutorial on this but remembered I had brought the HC06 module, so decided to dig it out. Before I connected the module I had already tested the UART using a free terminal program called Putty running on Windows. The MSP430 UART example programs are enough to learn the basics and get you started, the code I used is based on one of the examples. After having great success with the initial UART tests, I then connected the bluetooth module. To test the module I needed a similar program to Putty but running on Android, you will find dozens of terminal programs for Android just by searching the Play Store. After some initial tests this worked fine and I had an LED switching on and off via bluetooth, all for about one hour of playing around. It was at this point I thought wouldn’t it be cool to have voice control, my Nexus 5 supports ‘Ok Google’ for voice activation and that gave me the idea. Now I have to stress my App doe’s not support ‘Ok Google’ this is the first iteration, in fact you have to hit a button first and then speak the command. 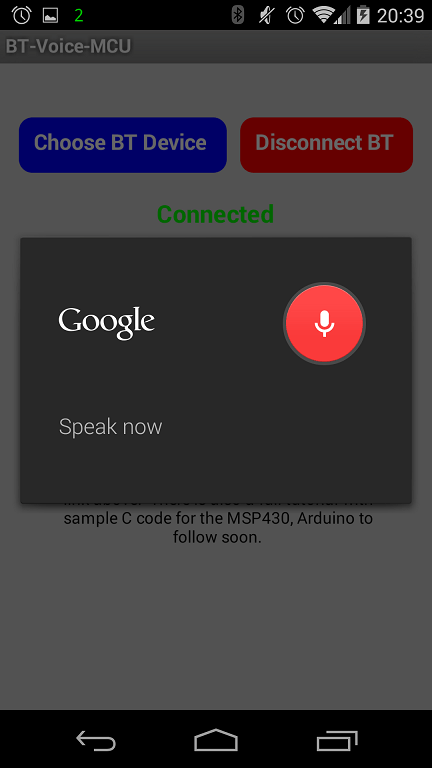 I will write more about the Android App, but first lets go through the MSP430G2553 code. I am only going to run through the code quickly, as it can be downloaded below so will just walk through the main parts. The first block of code deals with the watchdog and clock set/up, this also ensures the clock is calibrated, the accuracy is required for the UART operation although there is still a small margin of error due to the internal oscillator tolerance. The GPIO’s are set-up next in lines 2 and 3, P1.1 and P1.2 are used for the UART. In order to configure these both the GPIO function select registers need to be set to 1, this configures the pins to function with the secondary peripheral module. If you are not familir with some of the GPIO or registry configuration commands, I would recommend you take a look at my two part MSP430 Programming Tutorial Part/1 and Part/2. Lines 4 and 5 are used to configure P1.0 and P1.6, these are connected to the on-board LED’s, and are purely used here as a simple demonstration. The next block of code is used to configure the Universal Serial Communication Interface (USCI), this supports multiple serial communication modes. The MSP430G2553 has two USCI modules, USCI_A and USCI_B, USCI_A is used here in UART mode. Starting with line 2 this configures USCI_A0 control register 1 and sets the clock source as the SMCLK. Line 3 configures the USCI_A0 baud rate control register 0, using a value of 104. The SMCLK is running at 1MHz, therefore 1MHz divided by 104 = 9615.4, which is almost 9600 baud. Line 4 configures the USCI_A0 baud rate control register 1, this is used for clock prescaler settings more information can be found in the family guide with relation to this. Line 5 configures the USCI_A0 modulation control register, this parameter determines the modulation pattern, in short terms this allows extra adjustment depending on the divided clock frequency and desired baud rate. Therefore providing a mechanism to achieve the most accurate result, with as little deviation from the desired baud rate. Line 6 configures the USCI_A0 control register 1, this time it performs a software reset which initialises the USCI state machine. Line 7 enables the interrupt on the USCI_A0 receive buffer. Line 8 enables low power mode 0 which turns the CPU off and interrupts. So now that the USCI_A is configured the processor will switch off until data is received, then when the receive buffer has a new byte of information an interrupt will be called. The code snippet above is inside the interrupt handler for the USCI_A receive buffer. Line 1 assigns the data inside the buffer to the variable Rx_Data, line 2 is used to wake up the CPU. The variable Rx_Data is then used in a switch case statement to determine what has been sent over bluetooth. The App on the phone can be programmed to send a string, but this first iterations simply converts a string into a single ASCII value, which is then sent over bluetooth. In the case of the code running on the MSP430, it is using the switch case to determine the ASCII value represented by a hexadecimal number. The ASCII value sent and shown in line 3 is 0x41 which is a capital A, and line 4 is 0x42 which is a capital B. So when you say the word ‘On’ the phone App translates this and sends a capital A to the HC06 bluetooth module, when you say the word ‘Off’ a capital B is sent. There are other commands and I can and will add more, the full list currently supported is further down the tutorial. The rest of the code shown is purely for demonstration, basically line 4 and 11 are used to disable a timer interrupt. The timer interrupt requires disabling as the flash demo is not used if the on or off commands have been given. Line 5 and 12 are used to change the function of pin P1.6 to a GPIO function. Line 6 is used to turn the on-board launchpad LED’s on, and line 13 is used to turn the on-board launchpad LED’s off. I am not an Android App developer so this was put together quite quickly, literally six or so hours. I have been testing it with the launchpad and it performs well, there were a few early teething problems but now it seems pretty solid in operation. The App can currently only be downloaded here, I was going to upload to the Play Store but Google wanted 25$ for the privilege. So I decided not to upload at this stage, as it may not be of any use to anyone other than me…time will tell! I am not running through how to code the App here, just showing some screen shots of the operation with some notes, as the video should really cover this. I have only tested this on my Google Nexus 5, so unsure if the layout will change on other phones. If I have left any areas unclear or you have issues, leave a comment at the end of the article and I will answer as soon as I can. Before running the App you need to enable your Bluetooth, wasn’t sure how to do this and it does not prompt you to enable it yet. You will then be taken to a screen with a list of bluetooth devices, as you can see I have the HC06 device listed. To select the device just tap on the listed device. The HC06 module has a small LED on the board, this flashes when not connected, becoming solid once the device is connected. If its your first time connecting you will need to pair the devices, the most common password used for the HC06 seems to be ‘1234’. After a few seconds the screen will return to the main window, and you should notice the red text has now changed green and reads ‘Connected’. You will notice directly below this text is more black text which says ‘Captured Speech = ?’, this indicates no speech has been captured. 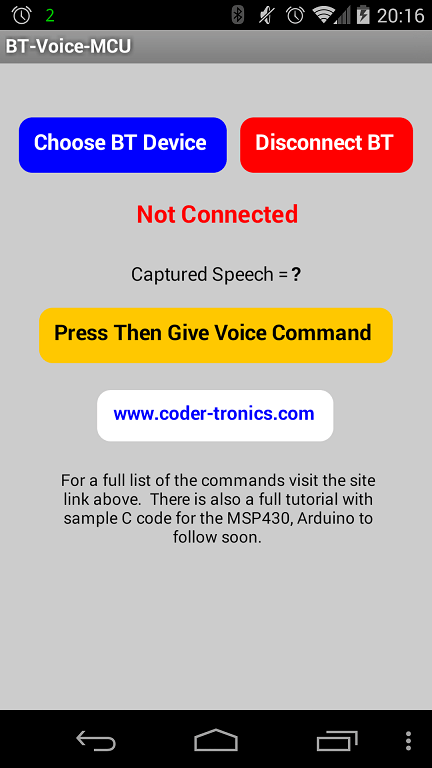 By pressing the orange button which says ‘Press Then Give Voice Command’, you will enter the speech capture mode. The capture mode is just Google’s Speech to Text, this as the name suggests will convert your speech to text. The next screen shot demonstrates the captured speech being displayed, this is not a recognised command word shown, it could be in future though. I have left all words displayed as if Google’s application has misidentified your speech, it’s better to know where the error lies. I guess I could have the recognised word change green for a valid command and red for an invalid one, so will maybe implement that at a future date. You can disconnect the bluetooth device any time by pressing the red button labelled ‘Disconnect BT’. I will probably add forward, backward, left, right and a few other obvious command words. The link below contains the zip file with the full example C code, there is a small advert page first via Adfly, which can be skipped and just takes a few seconds, but helps me to pay towards the hosting of the website. I take great care when writing all the tutorials and articles, ensuring all the code is fully tested to avoid issues for my readers. All this takes time and a great deal of work, so please support the site by using the Adfly links etc. If you have found this useful or have any problems implementing, please feel free to leave a comment and I will do my best to help. **Update 18/01/2015 the Android App has been updated and now includes some additional commands, for a full list see this Excel file, the link below has also been updated. The link below contains the zip file with the full Android App.apk file, there is a small advert page first via Adfly, which can be skipped and just takes a few seconds, but helps me to pay towards the hosting of the website. I guess I need to put some sort of disclaimer here as this is a phone App, and untested on any other phone except my Nexus 5, but it appears 100% stable and has not caused any issues. If you download and use this App, I am not responsible for any issues you may encounter so you do so at your own risk. In this switch debouncing tutorial part 2 C code debounce algorithms will be looked at further, and their effectiveness. All the software solutions shown will be demonstrated on the MSP430G Launchpad. However the basic principle of operation shown in the examples, can be applied to all microcontrollers, particularly the last example which is based on some code found at Jack Ganssle tutorial, this can be easily implemented on any system using the C language. The first debounce algorithm example is based on some Arduino code, which uses the millis() function. In this case the millis second count is generated by the watchdog timer on the MSP430. The launchpad switch connected to GPIO P1.3 is used in this test code. The while loop on line 1 is inside the main function, line 5 AND’s port 1 with BIT3 as this is the only GPIO pin of interested. Lines 6 to 9 will set the variable reading to a 1 if the value on pin P1.3 is a 1 i.e. not pressed, and 0 if the switch is pressed. Lines 11 and 12 check to see if the switch has changed from it’s previous stored state, if this is true then the time when the switch was pressed is saved to the variable lastDebounceTime. Lines 14 and 15 determine if the switches state hasn’t changed for a time equal to the variable debounceDelay, this then means that it is the current stable state of the push switch. The stable state is assigned to the variable switchState, then lines 17 to 20 determine the if the LED connected to GPIO P1.0 is on or off. The debounceDelay was set to 10, and the algorithm performed very well allowing fast presses of the single switch, without any issues. The watchdog timer was used in this example as it was simple to set-up and generate an interrupt every 0.5mS. Lines 36 to 33 show the interrupt handler, some basic statements inside the interrupt generate a 1mS count, which continuously increments. The function Mils_Count() in lines 35 to 39, is used to obtain the current count value. The watchdog timer is not meant to be used in this way, but it is so often disabled in many examples, yet is a resource that can be exploited. If you were producing a production embedded system this would probably not be the case, but this adds a little extra functionality to some of the low end MSP430G devices. The watchdog set-up shown will be used in some of the other debounce examples in this tutorial, and can easily be substituted with a standard timer. The second example configures the GPIO pins to trigger interrupts when a change in state is detected, which is caused by a switch being pressed. Only the interrupt handler is shown in the code snippet below, but the entire C code can be downloaded further down the page. There are two GPIO pins set-up to generate interrupts P1.3 and P1.7. When a switch is pressed on either of these pins, the interrupt handler is called. The switch case statements are used here, the port 1 interrupt flag register (P1IFG) being used as the switch. Once the correct pin interrupt has been identified, the interrupt edge select is toggled (lines 8 and 14). Then the corresponding LED is toggled, as shown in lines 9 and 15. 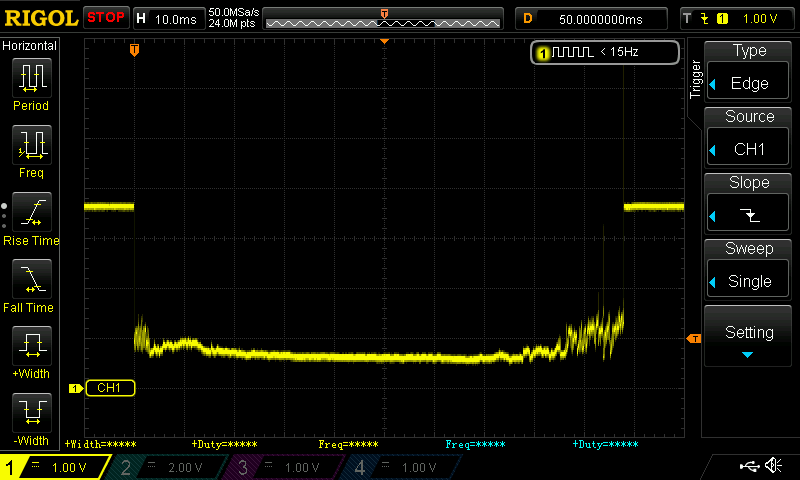 Lines 10 and 16 use a delay function which basically waits for 40mS (1MHz clock). This produced a reasonable outcome at slow to medium rates, pressing the switch at a faster rate produced indeterminate results. The delay function is not the best method to carry out a delay as it wastes CPU time. This technique is also not as robust a the first algorithm, especially if the switch is pressed quickly, but it does allow a whole port of switches to be used. The third example has two examples of switch debounce algorithms, these are split into two individual functions which can be run from the main function, simply by commenting one of them out at a a time. The functions incorporate aspects of the previous two examples, allowing multiple switches to be debounced. The code snippet below shows both of the functions Press_Time() and Debounce_Buttons() residing inside a while loop, which is inside the main function. The Press_Time() function will be looked at first. Starting with line 3, the if statement is used to ensure that the switches connected to BIT3 or BIT7 have been pressed, if not the statement is considered false. Line 5 assigns the variable state with the AND’ed value of port 1 (P1IN) with hex value 0x88 or binary 10001000. Line 7 assigns the current Mils_Count() value to the variable Reaction_Count. The switch case statements are used here with the variable state being used as the switch. If the switch on P1.7 is pressed then the case statement on line 14 will be selected. A while loop is then entered, which waits until the current Mils_Count() minus the variable Reaction_Count is greater than the variable Button_Reaction_Delay. This allows a tunable delay to be entered with ease, for testing a delay of 100-150mS was found to produce satisfactory results. This method produced better results than the interrupt method, but will suffer with increased switching speed. The second function Debounce_Buttons() is basically a copy of the first example. The variables are just doubled up and surrounded by a if statement so the code is only executed when a switch is pressed. This works well as per the first example but with two switches, however the code is very inefficient, due to the large number if statements that are executed each time a switch is pressed. This fourth and final example is based on sample code provided by Jack Ganssle, he has an excellent tutorial located here. The code is based on his third example, there is also a good description of the code operation with his article. The code snippet below shows the main body of the algorithm, I have made some modifications adding a compound bitwise AND operator, as well as adding some of his considerations regarding OR’ing the final debounced port value. Line 6 shows a function call for rawPortData(), this function simply returns the current state of port 1 and can be seen below in the next code snippet. The debounceSwitch() function returns the debouncedORd value, and is called in the following way. The checkButtons() function uses switch case statements to interpret which switch or GPIO pin has changed, the nice part about this code is the debouncedORd value makes the code very intuitive. This last example is easy to port to other microcontrollers, just by changing the code in functions checkButtons() and rawPortDate(). Needless to say this code works very well and produces excellent results with the PCB tac switches used, under fast or slow switching. In this switch debouncing tutorial part 1 the cause and effect of switch bounce will be explained and demonstrated, then a cost effective hardware debouncing solution will be discussed, with oscilloscope captures to demonstrate the results. The last section of part 1 will show a simple program based on the MSP430 , this can be used to see the effects of a particular switch connected to the GPIO. Switch deboucing tutorial part 2 of this tutorial will look at further C code debounce algorithms and their effectiveness. All the software solutions shown will be demonstrated on the MSP430G Launchpad. However the basic principle of operation shown in the examples, can be applied to all microcontrollers, particularly the last example which is based on some code found on Jack Ganssle tutorial, this can be easily implemented on any system using the C language. Switch contact bounce is a common issue for all mechanical switches, this includes mechanical relays. The contact bounce occurs when the metal contacts of the switch are forced together, the property of the metals used causes the contacts to bounce apart. How often the contacts bounce apart before finally latching shut depends on the contact type and the property of the switch. The bouncing effect can causes multiple high frequency pulses, as opposed to a clean transition at the output. If we take an example of a microcontroller with a switch connected to one of it’s GPIO pins, the microcontroller is able to read these high frequency pulses, misinterpreting them as legitimate presses, resulting in an undesired action. The image below shows a basic circuit used to test switch contact bounce. With the circuit constructed on some breadboard, an oscilloscope was connected to the GPIO pin header and set to trigger when the switch was pressed, the resultant capture can be seen below. 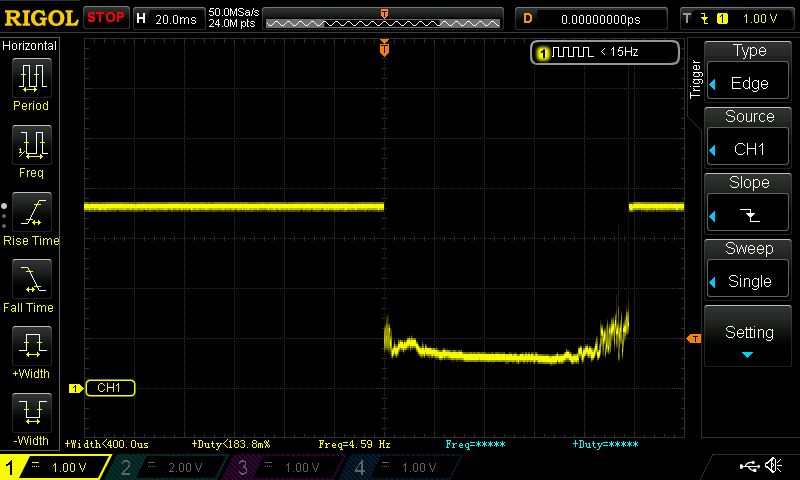 The oscilloscope captures shows the steady state of just over 3.3V, as the switch is pressed and released, multiple pulses are visible during this time. The switch used for this capture was an old switch I found in a bag of spares I had, it was a small momentary touch which had a sprung button. Many of these extra pulses would be picked up by a microcontroller, causing unexpected behaviour with your program if no debouncing was used. The next oscilloscope capture was taken using a small PCB mounted tac switch, this was set-up in the same way as the previous test. It can clearly been seen that this inexpensive PCB switch has a far superior switching action, but there is still bouncing going on, as the expanded image below shows in greater detail. There are many hardware solutions to solve switch contact bounce, ranging in price from a dedicated microcontroller programmed purely to act as a debouncer, or a dedicated key encoder (MM74C923) with built in debounce, to a low end solution using just a resistor and capacitor. This tutorial will only cover the latter option, as when combined with a suitable software algorithm, provides a cost effective solution for most small microcontroller applications. A simple resistor capacitor switch deboucing circuit can be seen below. The resistor capacitor combination forms an RC circuit, which has a time constant determined by τ = R*C, therefore 47kΩ*100nF = 4.7mS. The capacitor is considered charged after approximately 5*τ, therefore roughly 25mS. So when the switch S2 is pressed effectively closing the switch, the voltage across the capacitor is discharged through the switch to ground. As there is very little resistance this happens quickly, but as will be shown not instantly. When the switch is released and becomes open, the capacitor is charged via R2 and should take approximately 25mS to charge back up to the supply voltage. Any spikes caused by bouncing contacts are absorbed by the RC circuit, however care must be taken when selecting the values to ensure the switching action is fast enough for the project. If the resistor or capacitor is too large the time lag may cause the system responsiveness to suffer, too small and a switch with a long bounce characteristic will still have an issue. Capturing the switch bounce with an oscilloscope is the best way to view the problem and then take the appropriate action. 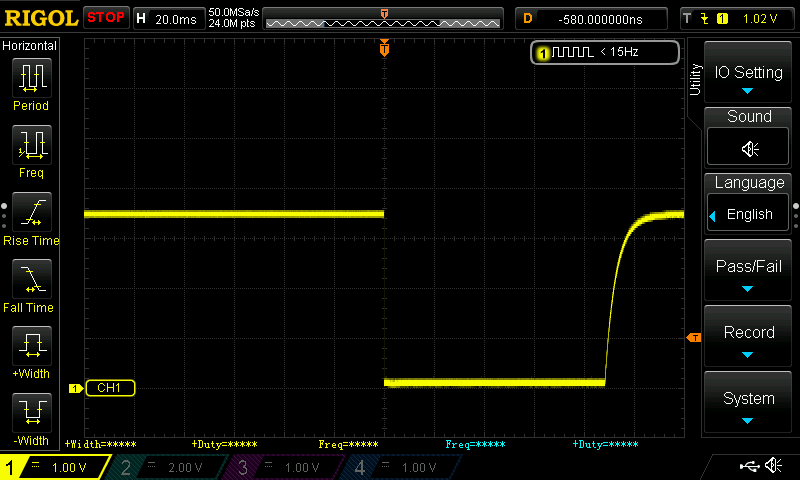 The oscilloscope capture below shows the circuit in action using the cheap PCB tac switch. This clearly shows a huge improvement in the switching noise, the falling edge shows a clean edge, while the leading edge is curved due to C1 charging through R2. The next image shows the falling edge of the capture on a smaller time base. The falling edge can still be seen to show the capacitor discharge curve, this takes approximately 1uS, therefore the resistance to ground is approximately 2Ω. The next image shows the rising edge of the capture on a smaller time base, the image clearly shows the capacitor curve levelling off around 25mS. 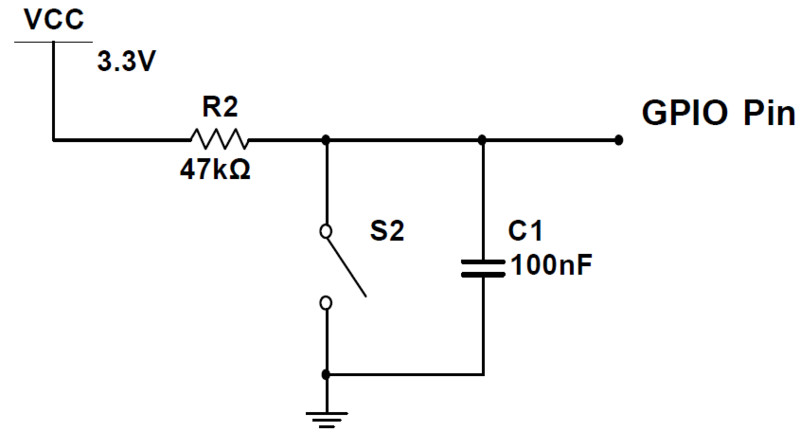 This circuit will work sufficiently in most situations, but it is best practice to discharge the capacitor in a more controlled fashion, especially if there are higher currents and voltages involved. A second resistor can be used in conjunction with R2, thus ensuring C1 has a higher resistance path to ground, when the switch S2 is closed. 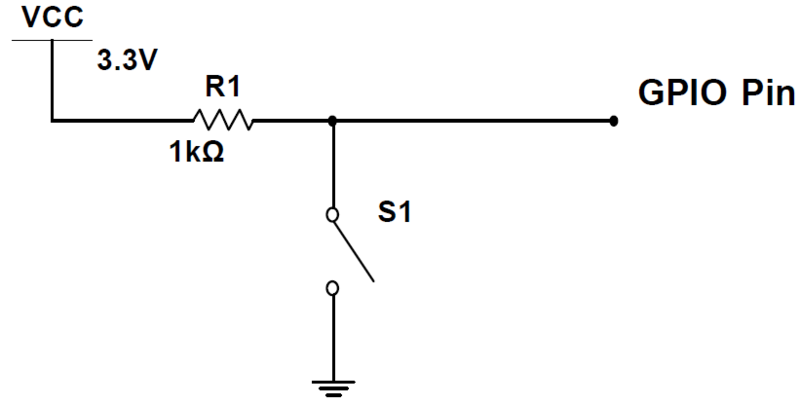 The image below shows a circuit using this additional resistor (R1). The combination of R1 and R2 has very little impact on the original time constant, but allows a controlled discharge of the capacitor to ground. The value of R1 would typically be less than 6.8kΩ, being dependant on the requirements of the system. This will ultimately improve the life of the switch, as it avoids high instantaneous currents. Before finishing part 1 of this tutorial, a basic code example is shown below which allows some of the contact bounces from a switch to be recorded on a MSP430 Launchpad. The code snippet above is used with an external switch, connected to GPIO pin P1.0, which is configured to function with Timer0_A. Timer0_A is set-up in capture mode and configured to trigger an interrupt on every falling edge pulse. Every time the interrupt is triggered the variable count is incremented, therefore by running this code it is possible to determine roughly how noisy a switch is. To see the updated count value, the code can be run then the switch pressed, the code can then be paused to check the value of Count, or a breakpoint can be set and the variable Count watched. In Part 2 debounce algorithms will shown with C examples, they will all be written to run on the MSP430 but the principle of operation can be carried over to other microcontrollers. The last code example in particular can easily be implemented on other microcontrollers. In this second part of the MSP430 programming tutorial examples of GPIO register settings will be shown and explained. Additionally register examples for some of the internal peripherals will be demonstrated and explained. The first part of the tutorial can be found here. The following examples should help to illustrate how you change the individual bits, as well as multiple bits in the GPIO registers to achieve exactly what you want. There is a reference to BIT3 and BIT7 being defined as hexadecimal values, these values can be found in the msp430g2253.h header file inside Code Composer Studio, or the MSP430 software provided by Texas Instruments. So by using this statement we only change BIT7 of port 1 to a logic 1 or GPIO P1.7. This is very powerful as it allows individual pins to be configured, without effecting other pins on the same port. But what if you want to adjust multiple pins to outputs, well that can be achieved quite easily, two ways are illustrated below. So turning a single registry bit or multiple bits to a logic 1 are covered, how about assigning a logic 0 to a single register bit or multiple register bits. The following images will demonstrate how this is achieved. There is one more operator that is commonly used on GPIO pin register bits, that is the ^ or XOR bitwise operator. This is used in many examples on the internet to toggle the LED’s on the launchpad, the example below demonstrates it’s use. Although all these examples are only used with the P1OUT register, the same principles can be applied to all the GPIO port registers. The examples shown where multiple registers are written to, using a combined hex value will also optimise any code, saving execution time by removing additional arithmetic in the form of an addition. Understanding how to change bits inside the peripheral registers, is not a great leap in understanding from the GPIO ports. 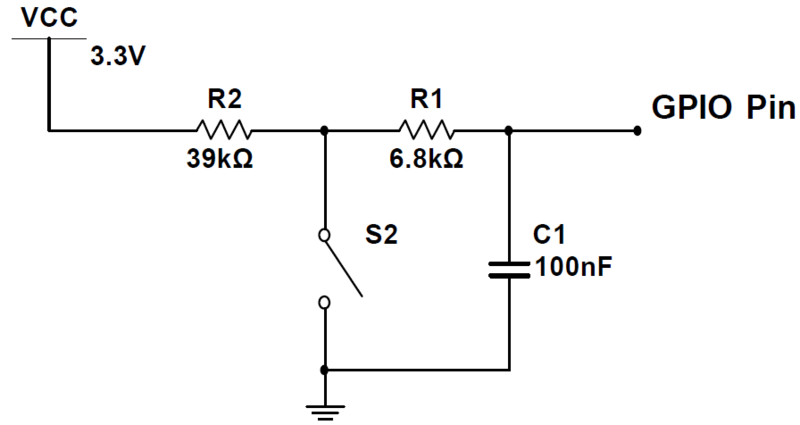 A few examples will be shown which are based on the ADC peripheral. The ADC10 Control Register 1 (ADC10CTL1) will be used as the example register, but all registers will follow the same principle. The image below is extracted from the MSP430 family guide and shows the ADC10CTL1 register. As with the GPIO port pins Texas Instruments have provided defines in the header files, so it is not necessary to remember the binary or hexadecimal values for the register settings. The names used for these register settings are shown above i.e. INCHx and ADC10DIVx. As INCHx occupies four Bits it therefore has 16 possible combinations and ADC10DIVx has 8, hence the small x after each name. The next two images are again extracted from the MSP430 family guide and show how the bit combinations correspond to different parameters. 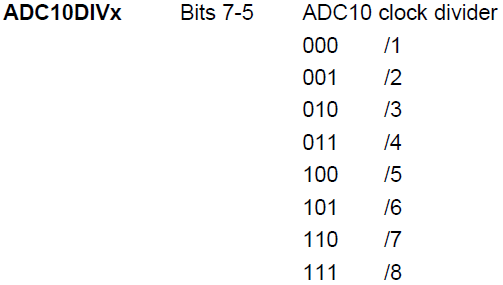 So now lets look at a command to set the ADC10CTL1 register using the parameters INCHx and ADC10DIVx. The code snippet above basically adds the two parameters together and assigns them to the register using a compound OR assignment operator. Now lets look at this in binary form, which will help shed some light on the process. So by using this command the register parameters can be set individually, or multiple parameters can be set in one go. As with the GPIO port settings a hexadecimal value can be used to set the parameters as well. The code snippet above achieves the same result as well as being more efficient, however the code becomes much more obfuscated. That covers setting the register bits to 1, how about setting the register bits to 0. This is achieved in the same way as with the GPIO, the image below illustrates the operation. In this MSP430 programming tutorial part 1 some of basic C operators used for programming the MSP430 will be looked at. The GPIO port registers will then be looked at in greater detail. In part 2 example code for the GPIO registers will be shown and explained, as well as examples for the the ADC peripheral register. The MSP430G2253 Launchpad will be used as the reference microcontroller, the primary IDE used is Code Composer Studio (CCS). The MSP430G series family guide, as well as other useful information can be downloaded directly from Texas Instruments webpage here. If you are familiar with Bitwise operators, skip this section and and start with the MSP430 GPIO ports section further down this page. Some basic C language bitwise operators will be looked at first, then how these apply to GPIO ports will be demonstrated. The C language has 8 types of operators and bitwise operators are 1 of these. The bitwise operators are fairly easy to understand and if you have ever looked at logic gates and truth tables, then some of these will be immediately recognisable. For the following examples two variables will be used a and b, they will also be assigned values; Decimal: a = 48 and b = 24, Binary: a = 0011 0000 and b = 0001 1000. The binary AND operator copies a bit or logic 1 to the result, only if a logic 1 exits in both operands. So the result of a&b = 0001 0000 or 16 in decimal. The binary OR operator copies a bit or logic 1 to the result, if it exists in either operand. So the result of a|b = 0011 1000 or 56 in decimal. The binary XOR operator copies a bit or logic 1 to the result, if it exists in one operand as a logic 1, but not both. So the result of a^b = 0010 1000 or 40 in decimal. The binary NOT operator effectively flips the bits, so 1’s become 0s and vice versa. So the result of ~a = 1100 1111 or -48 in decimal (signed variable) or 207 in decimal (unsigned variable). The binary LEFT SHIFT operator moves the operands bits left, by the number of bits specified, which is this case is 2. So the result of a = a<<2 = 1100 0000 or 192 in decimal. This also effectively multiplies the value of a by a factor of 4. The binary RIGHT SHIFT operator moves the operands bits right, by the number of bits specified, which is this case is 2. So the result of a = a>>2 = 0000 1100 or 12 in decimal. This also effectively divides the value of a by a factor of 4. Looking at the 20 pin MSP430G2253 supplied with the Launchpad, it has two GPIO ports. Both ports have 8 GPIO pins numbered as follows, port 1 pins P1.0 to P1.7 and port 2 pins P2.0 to P2.7. The image below is extracted from the MSP430G2253 datasheet. All the individual GPIO pins can be configured to connect to internal peripherals, for example, providing a connection for the ADC to an external source, or providing the output from Timer module in the shape of a PWM signal. The GPIO’s as the acronym tells also provide General Purpose Input and Output operations. Not all of the GPIO pins can be configured to be used by all the internal peripherals, a detailed list of how the pins can configured can be found in the datasheet for that particular microcontroller. The image below again shows an extract from the MSP430G2253 datasheet, illustrating the GPIO pins P1.0 and P1.1 and their individual associated peripheral functions. Defining how each of the eight GPIO pins are configured for each port, is achieved by individual registers. The PxIN register reflects the value of the signal being input into the GPIO pin, when configured as an I/O function. So by reading this value you can determine if there is a logic 0 or a logic 1 on the input. Bit = 0: The input is low, Bit = 1: The input is high. A statement using this function for GPIO port 2 and pin P2.4, could look like this if ((P2IN & Bit4) == BIT4);. Pullup/pulldown resistor disabled: Bit = 0: The output is low, Bit = 1: The output is high. Pullup/pulldown resistor enabled: Bit = 0: The pin is pulled down, Bit = 1: The pin is pulled up. A statement using this function for GPIO port 1 and pin P1.4, could look like this P1OUT &= ~BIT4. The PxREN register enables or disables the internal pullup/pulldown resistor, which corresponds to the individual I/O pin. Bit = 0: Pullup/pulldown resistor disabled, Bit = 1: Pullup/pulldown resistor enabled. A statement using this function for GPIO port 1 and pin P1.5, could look like this P1REN |= BIT5. The PxDIR register selects the direction of the I/O pin, whether it will be an input or an output. This is regardless of the selected function of the pin. Bit = 0: The port pin is switched to input direction, Bit = 1: The port pin is switched to output direction. A statement using this function for GPIO port 1 and pin P1.3, could look like this P1DIR |= BIT3. The PxSEL and PxSEL2 registers allow the individual GPIO pins to be associated with the internal peripheral module functions, or simply left as standard I/O ports. The image below was extracted from the MSP430 family guide. A statement using this function for GPIO port 2 and pin P2.1, could look like this P2SEL |= BIT1;. When using these registers, it is important to consult the datasheet and pin schematics, for the specific device. Only GPIO ports 1 and 2 have interrupt functionality. The P1IFG and P2IFG registers hold the interrupt flag for the corresponding I/O pin, the interrupt flag is set when the selected input signal edge occurs at the pin. Bit = 0: No interrupt is pending, Bit = 1: An interrupt is pending. A statement using this function for GPIO port 1 and pin P1.1, could look like this P1IFG &= ~BIT1;. The P1IES and P2IES registers allow the interrupt edge type to be selected for each I/O pin. Bit = 0: The PxIFGx flag is set with a low to high transition, Bit = 1: The PxIFGx flag is set with a high to low transition. A statement using this function for GPIO port 1 and pin P1.1, could look like this P1IES &= ~BIT1;. The P1IE and P2IE register bit enables the associated PxIFG interrupt flag. Bit = 0: The interrupt flag is disabled, Bit = 1: The interrupt flag is enabled. A statement using this function for GPIO port 1 and pin P1.1, could look like this P1IE |= BIT1;. Texas Instruments also recommends configuring unused pins as I/O function, output direction, and left unconnected to prevent a floating input and reduce power consumption. So how to change the GPIO Registers to what you want, well part 2 of this tutorial will make the GPIO settings clear and hopefully easy. Additionally an ADC register will be explained and demonstrated. In this MSP430 timer PWM tutorial the basic workings of the on board timer peripheral will be explained, along with some C code examples which can be downloadable at the end of the tutorial. Additionally the video below demonstrates the examples ‘A picture paints a thousand words, a video displays a thousand pictures’. The MSP430G2253 will be used as it has two timers opposed to the MSP430G2231 which only has one timer, this will allow for different examples to be shown. All the code in the MSP430 timer tutorial is written in Code Composer Studio (CCS) v5.5. As the tutorial will be using the MSP430G2253 as the test microcontroller, downloading the datasheet for this maybe of use and can be found here. Before reading further if you are having trouble understanding how the registers work, and how the C code updates the individual register settings? It would be worth reading my MSP430 Programming Tutorial, Part 1 covers the basics and Part 2 gives clear examples. You can find them here Part 1 and Part 2. The 16 bit timer increments or decrements a value from the Timer_A register (TAR), every rising edge of the clock pulse. The TAR value can be read or written with software, and an interrupt can be enabled to generate when it overflows. If the timer is run asynchronous to the CPU clock, any reading from the TAR should occur while the timer is not running, as the result is likely to be unpredictable. Up/Down – The timer repeatedly counts from zero up to the value of TACCRO (+1) and then back down to zero. The clock source for the timer can be from ACLK, SMCLK or from an external source via TACLK or INCLK (Device specific). The clock source selected can be then divided by 1, 2, 4 or 8. The capture/compare blocks inside Timer_A are all identical. Any of the TACCRx blocks may be used to capture timer data or generate intervals. When in capture mode the Capture Compare inputs CCIxA and CCIxB, can be connected to external pins or internal signals. They can be configured to capture on a rising, falling or both edges. 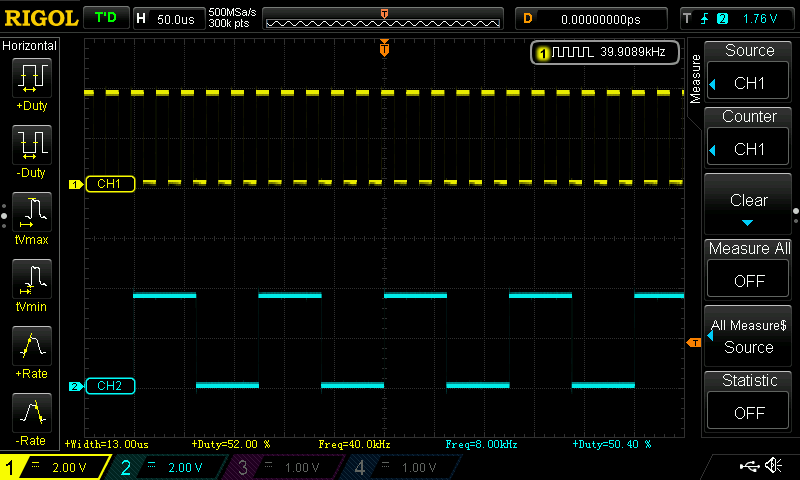 The compare mode is used to generate PWM output signals, or interrupts at specific time intervals. Each capture/compare block has an output unit, which is used to to generate output signals like PWM. The Timer_A module has two interrupt vectors linked to it: TACCR0 interrupt vector TACCR0 Capture Compare Interrupt Flag (CCIFG) and Timer_A Interrupt Vector Register (TAIV) for all CCIFG flags and Timer_A Interrupt Flag (TAIFG). The TACCR0 CCIFG has the highest priority of all the interrupts for Timer_A. The TAIV is used to prioritise and combine the TACCR1 CCIFG, TACCR2 CCIFG and TAIFG flags. The Timer_A module is configured with software by setting the bits inside the various registers, which alter the timers parameters. The image below list the various registers associated with the Timer_A module. The Timer_A capture/compare register 0 or TACCR0, is used in two cases. In compare mode this holds the value for comparison with the timer value in the TAR. 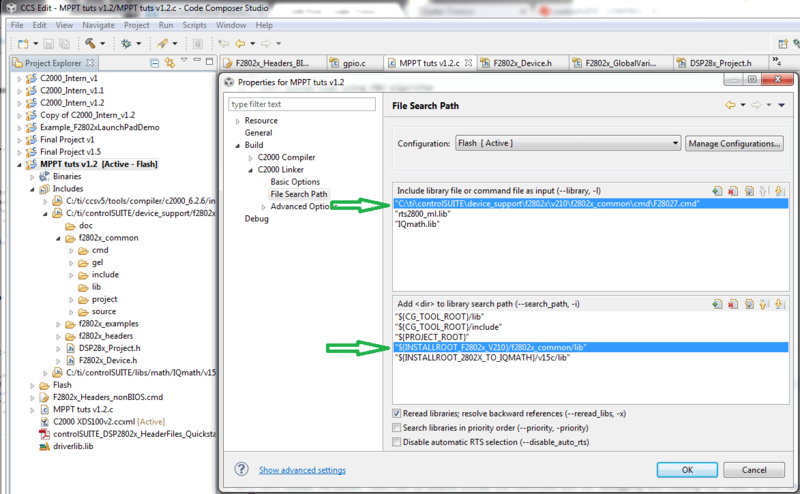 When in capture mode, the value in the TAR is copied into the TACCR0 when a capture is performed. An example of the register code would be as follows TA0CCR0 = 200-1;. The Timer_A capture/compare control register 0 or TACCTL0, is a 16 bit register used to determine how the TACCR0 is set-up. The register controls whether the timer module is set to capture or compare. The trigger edge for the capture mode can be set, as well as where the source originates from, either internal or external. Asynchronous or synchronous operation can determined, as well as synchronised capture or compare input. There are various output modes, which are used to determine the operation of PWM signals for example. Also this register allows interrupts to enabled for the timer module. An example of the register code would be as follows TA0CCTL0 = OUTMOD_7 + CCIE;. The Timer_A capture/compare register 1 or TACCR1. Has the same operation as TACCR0. An example of the register code would be as follows TA0CCR1 = 200-1;. The Timer_A capture/compare control register 1 or TACCTL1, is a 16 bit register used to determine how the TACCR1 is set-up. Has the same operation as TACCTL0. An example of the register code would be as follows TA0CCTL1 = OUTMOD_7;. The Timer_A capture/compare register 2 or TACCR2. Has the same operation as TACCR0. An example of the register code would be as follows TA0CCR2 = 200-1;. The Timer_A capture/compare control register 2 or TACCTL2, is a 16 bit register used to determine how the TACCR2 is set-up. Has the same operation as TACCTL0. An example of the register code would be as follows TA0CCTL2 = CCIE;. The Timer_A interrupt vector register or TAIV, is used to prioritise and combine the remaining interrupt flags. When reading the TAIV it will give the value of the current interrupt, as well as clearing that interrupts flag. This first example demonstrates the use of one timer, which is used to flash the MSP430G2253 Launchpad LED’s on and off. The code snippet below only shows the timer set-up and the interrupt handler, as these are the most relevant parts. The code is fairly short and quite simple to walk through, in line 5 we first load the TA0CCR0 with the value 3000. 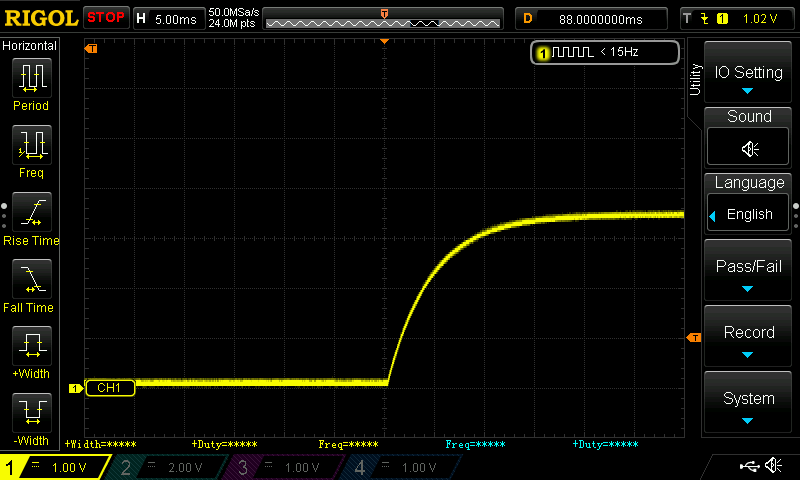 Line 6 turns the interrupt on for the TA0CCR0 when it overflows. Line 7 sets the clock source to ACLK (12kHz) and the counter to count-up mode. So the interrupt is generated every 250mS approximately. Line 9 sets the MSP430 to low power mode and enables interrupts. Lines 12 to 22 are the interrupt handler for Timer0_A, this interrupt automatically clears when called. Inside the interrupt handler, the variable Control is used to ensure the green LED flashes once for every time the red LED flashes four times. The closing brace marks the end of the main function. The second example demonstrates the use of two timers, which are used to output PWM signals on GPIO pins P1.2 and P2.1. The timer set-up code and also the GPIO set-up code is shown below. The clock was set to 8MHz for this example. Before walking through the code, the image below is extracted from the MSP430G2253 datasheet, this shows GPIO pin P1.2 and it’s functions. 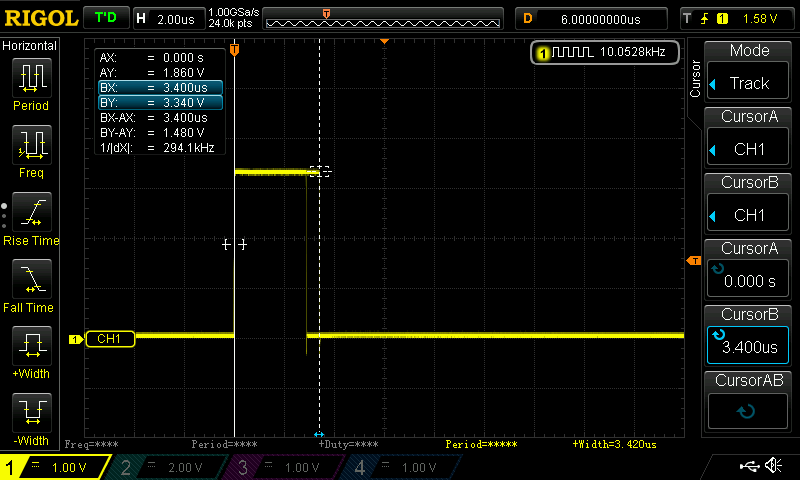 The line which is highlighted demonstrates P1.2 can be used as an input and output for Timer0_A. Walking through the code starting with line 5, this sets GPIO pin P1.2 as an output. Line 6 selects the function for GPIO pin P1.2, and in this case it is used for PWM. Lines 7 and 8 perform the same operation, except they are for GPIO pin P2.1. line 11 the TA0CCR0 is loaded with 200, this sets the PWM frequency to 40kHz approximately. Line 12 sets the output mode to reset/set. 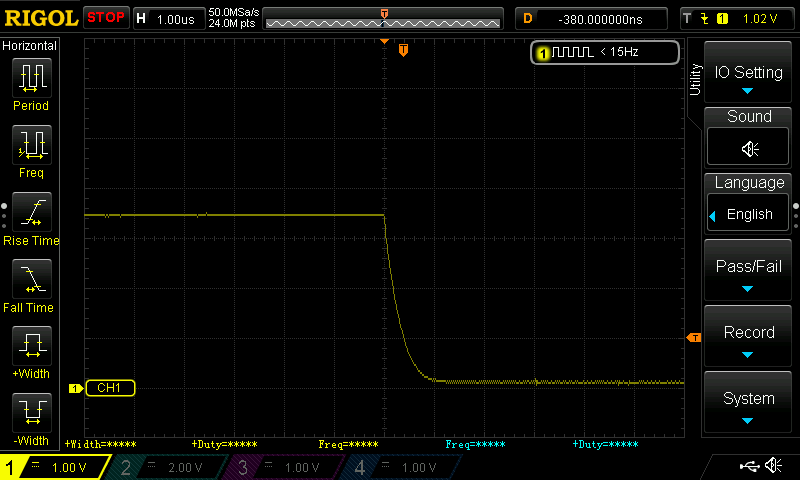 Line 13 sets the count value of TA0CCR1, which determines the PWM duty cycle, in this case 50%. Line 14 sets the clock used by the TA0CTL to SMCLK and the counter to count-up mode. Lines 17 to 20 set-up Timer1_A in the same way as Timer0_A, except the frequency is set to 8kHz approximately. 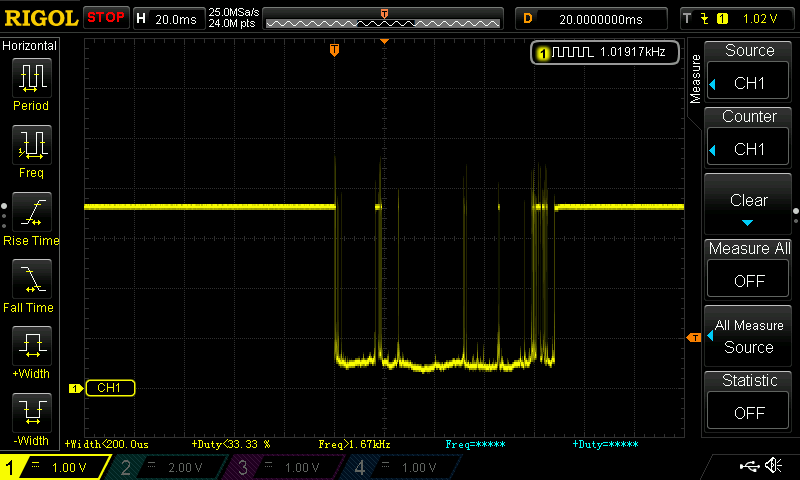 The image below shows a capture from the oscilloscope for this code, GPIO pin P1.2 is shown on channel 1 and P2.1 is shown by channel 2. The third example demonstrates the use of two timers, using PWM generated by Timer0_A and a timed interrupt on Timer1_A to alter the duty cycle. The PWM output is configured to output on GPIO pin P1.6. As with the previous code examples, only the timer set-up code is shown. The clock was set to 1MHz for this example. Lines 5 to 8 in this example are almost identical to lines 5 to 8 in the example 2 code. The main difference is the PWM frequency is set to 1kHz (clock set to 1MHz) and the duty cycle is initially set to 0.1%. Lines 11 to 13 set-up Timer1_A, this has a count of 4000 so generates an interrupt every 4mS. Line 15 sets the MSP430 to low power mode and enables interrupts. Lines 18 to 25 are the interrupt handler for Timer1_A, as with the first example this interrupt automatically clears when called. Inside the interrupt the value stored in TA0CCR1 is added to the variable IncDec_PWM which is multiplied by 2 every time the interrupt handler is called. IncDec_PWM is a global variable and assigned the value 1. This equates to the value in TA0CCR1 being incremented or decremented by 2, therefore the duty cycle changes by 2 or (0.2%) every time the interrupt handler is called. This equates to a transition time of approximately two seconds from high to low and low to high. The final if statement inside the interrupt handler reverses the direction of the duty cycle, causing the LED to decrease in brightness until a value greater than 998 is reached, and increase in value when a value less than 2 is reached. There is also one more additional example for the timer, which demonstrates the capture mode. This is actually part of a another tutorial based around switch debouncing, the timer is used to capture the undesired pulses generated by a noisy switch. You can find the additional code by browsing to the end of my Switch Debouncing Tutorial Pt/1. In this C2000 Programming Model Guide, the two basic approaches to programming on the C2000 will be over viewed using the C2000 Launchpad. Some code examples will be shown, as well as a code execution speed test comparing the two methods. All the code is written in Code Composer Studio (CCS) v5.5, with the latest version of ControlSuite released at the time of this article being posted. TI provides all the documentation required for programming the C2000, which can be found here. The Texas Instruments ControlSuite can be downloaded free of charge and includes support for two programming methods: Direct Register Access Model and Software Driver Model. There is also a third method, using Assembly language but that will not be covered here. Both of these models can be used independently or a combination of both can be used. Each model has advantages and disadvantages, which are summarised below. 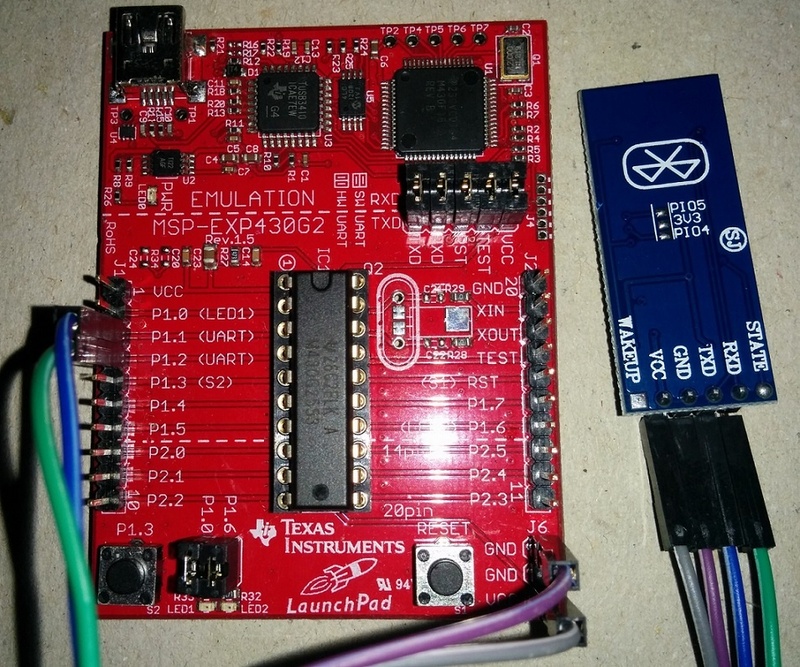 The direct register access model writes values directly to the individual peripherals registers, if you have programmed the MSP430G Launchpad it uses a similar method. All of the peripheral registers are defined in the corresponding header file contained in f2802x0_header/i/include, the image below shows this in CCS. The individual header files define the location of each register with respect to other registers within a peripheral, as well as the bit fields within each register. This is all implemented using structures, the header files only define the structures they do not declare them. A C source file is used to declare the structures with the physical memory of the device F2802x_GlobalVariablesDefs.c. 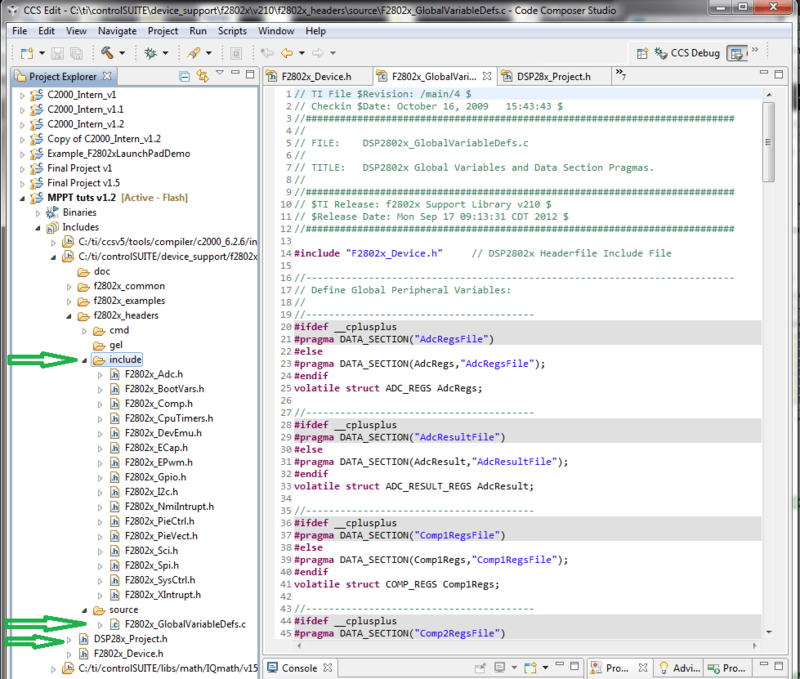 To use the direct register access model in an application, the file DSP28x_Project.h must be included in each source file were the register accesses are made. An example of a direct register access statement can be found in the code snippet below, this particular call clears the ADC interrupt flag for ADC interrupt 1. The software driver model uses an API provided by the peripheral driver library, which is used by applications to control the peripherals. Before a peripheral can be used, the driver header file needs to be included and a handle to that peripheral initialised. The code snippet below shows an example of this, illustrating the header file for the PWM peripheral, then the initialisation and finally two API function examples. A simple test was devised to illustrate the main differences between these two models, this test is also useful for testing control and timing applications. It has been used in a previous tutorial to access code execution time, which can be found here. There is also one more piece of additional code added, a variable called control. This variable is quite important as in between the interrupt calls, the code inside the while loop will still be executed. Therefore if the GPIO pin low statement/function is partly way through executing when the interrupt is called, it will then return to this point and cause multiple timing traces on the oscilloscope. This is due to the fact that there is an indeterminate time when the interrupt is called and what code is being executed at that time. So using the if statement inside the while loop which uses the control variable, reduces these unknowns and ensures the code is far more predictable. The code snippet below shows the code used in the main function, this code also demonstrates the equivalent direct register access statement to the software driver function for the GPIO pin 19 operation. The next four images show screen captures from the oscilloscope, for the direct register access model and the software driver model. It should be noted there is still a small variation in the timing as multiple traces are visible, hence two images are shown for each model allowing the variation to be calculated. What these oscilloscope traces show is the direct register access model clearly executes at a faster rate, the lowest and highest execution times are listed below for each model. How the models are used is dependant on the application: (1) If code size and execution time is not an issue it’s perfectly ok to use the software driver model. (2) If code size is not an issue but certain aspects where speed of execution and timing are critical, then using both methods could be applicable. (3) If code size and execution time are both critical, then the direct register access model is probably the best choice (Assembly language would be even better).